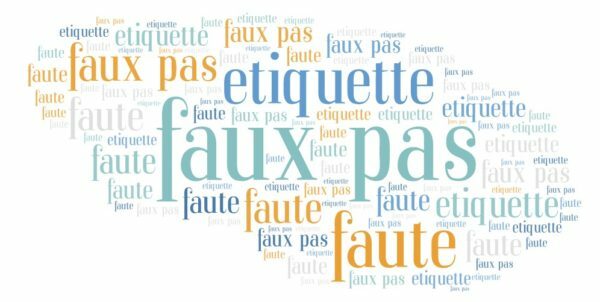 French Faux Pas to Avoid, Don’t make French blunders! French Faux Pas – Don’t make French blunders! Here is a list of what the French do and don’t do. Oui – Accept that kiss – or these kisses – a friend is about to give you to greet you ‘Bonjour’ with. Non – Don’t bring chrysanthemums to a dinner party – they’re the ultimate death flower. Oui – Drink water or wine with your meal. Don’t ask for a soda or a hot beverage. Oui – Learn how to say “Bonjour, Au revoir and Merci’. It will go a long way, I promise! And learn a bit of French with my Beginner’s course before you go to France. You’ll love it.